Protecting the confidentially of the documents is highly crucial in every organization. Many users convert digital documents to PDF format (Portable Document Format) with the belief that PDF files are difficult to modify. But it’s not true. PDF files can easily be modified by skilful computer users. Hence, the authenticity and integrity of PDF are becoming increasingly more important. Consequently, digital signatures have become a more and more essential feature. If you are particular about your documents’ confidentially, you can try the Aloaha PDF Signator Version 2.3.1, the latest version from software producer, Aloaha Software. With the Aloaha PDF Signator, users can sign and timestamp any existing PDF documents especially documents for official business communication such as electronic invoicing, confidential reports, important data, submitting of tenders, digital signing of contracts, etc. for long-term validation purposes. Aloaha does not require specially prepared PDF documents or signature fields. The digital signature of the PDF file will automatically be checked and indicated by the PDF viewer (Acrobat Reader). The users or readers shall not require any additional or specific software for this checking process. This signing software supports software certificates and qualified certificates on SmartCards/e-ID Cards. All CSP supported SmartCards are also supported by Aloaha. Some SmartCards are supported natively. These cards do not require a CSP (Crypto Service Provider) installed. Since Aloaha PDF Signator is a shareware, users are allowed to sign the PDF documents without any need to purchase the full Adobe Acrobat or Adobe Document Server for Reader extensions when using it. Users can open, view, navigate the PDF documents via Adobe PDF Signator. 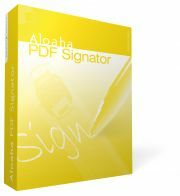 Aloaha PDF Signator supports Windows 98, Windows NT, Windows XP, Windows 2000 or Windows 2003. Download your Aloaha PDF Signator here.